When homeowners are looking for more space, they often look to the garage and basement. These spaces are typically a standard shape and have better temperature control than attics. However, attics have lots of potential for a unique extra bedroom. If you have an unfinished attic, it may seem like a daunting task to convert it into a beautiful finished bedroom. You probably think you're going to be spending a lot of time and money on one little room. However, with the right planning and pre-conversion considerations, your attic bedroom conversion can be done with minimal stress. 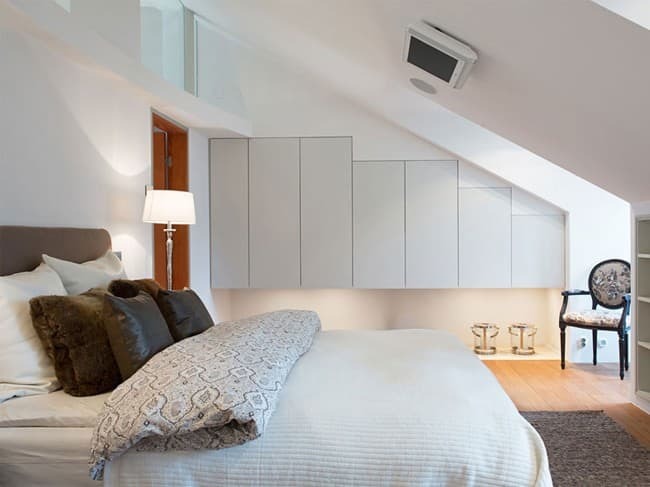 Access your new attic bedroom without taking up space on your main floor. Salter Spiral Stair provides space saving interior spiral stairs without sacrificing quality or style. Any home renovation or conversion is going to require the homeowners to take building codes and local building permits into consideration during the planning stages. Building code consists of different safety standards that are determined to ensure the safety and stability of your building. Things that are included in building code are the ceiling height, the width of the room, and the total square footage of the room. Meeting building code is a requirement if you plan to rent out your bedroom or sell the house at a later date. Before construction begins, check with your local municipalities to see if your project require a permit. Be sure to bring completed plans so they can give you an accurate answer. Any attic conversions that include altering the exterior of the house, such as the roofline or additional windows, will most likely require a permit. If you’re unsure about any of the aspects of your project and their safety standards, consult a contractor to find accurate answers that are directly related to your conversion. Any home renovation is going to add value to your home. 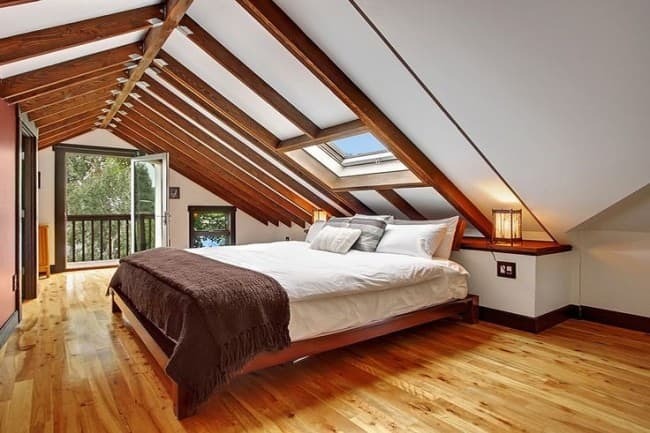 Converting your attic into a bedroom can add a lot of value to your home. Because the new room is a bedroom, rather than an extra recreational room, you will see a larger return on investment. According to the National Association of Realtors, homeowners that had an attic bedroom conversion saw an average return on investment of 61% when they sold their house. Added value can also be found in the form of extra income! Some homeowners choose to rent out their attic bedrooms. This may include an en suite bathroom and an exterior entrance to attic. This would all depend on your comfort level with your tenants. Once you’re through the planning stages, you have to start the actual conversion of your space. Each piece of your new room has special considerations that go towards create a beautiful and efficient attic bedroom. 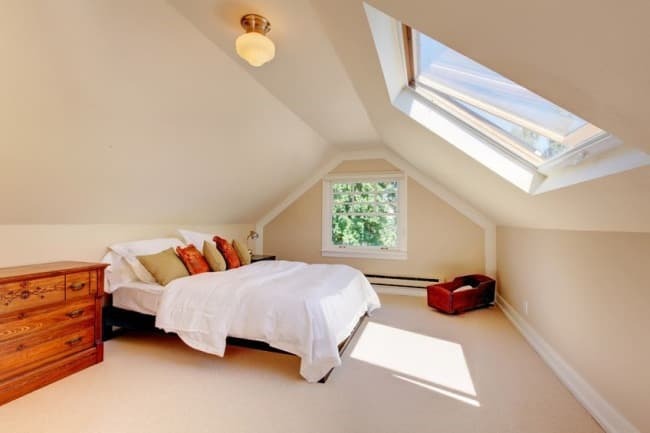 A common problem that homeowners have when converting an attic into a bedroom is the steep slope of the ceiling. It hinders any head room and limits the usable space in your attic. However, they shouldn’t be seen as a hindrance, but rather as a unique piece of architecture that can enhance your new bedroom. Highlight the unique architectural elements of your attic bedroom conversion by using ceiling treatments. Similar to wall treatments, adding an extra design element to your ceiling can create a one of a kind room design. While painting your ceiling an eye catching color is an easy way to create a focal point in your attic, there are other ways to create an interesting design. You can use the same idea that is used for home library designs and create unique paneling on the angles with different types of molding. If your space is smaller, paint over the molding to create a textured wall that is a singular color. This adds visual interest without overwhelming a small space. Your attic bedroom conversion is going to have less wall space than other rooms in your home due to the steep ceiling angle. However, this doesn’t mean that you’re limited in design. From different wall treatments to unique storage solutions, your attic walls have a lot of potential. Assuming you will have to add an additional interior wall to your existing attic framework, it is completely customizable. When it comes to wall treatments keep them simple so you don’t overwhelm the smaller space. Light colors keep your new bedroom feeling larger and more open when paired with natural light. If you want to add a more polished finish to your attic walls, creating faux panels with molding, much like the ceiling panels mentioned above, are a great touch. Because your attic probably doesn’t have full size walls, you have to utilize all of your space. Knee walls may seem like a waste because of their shorter height, but you can easily make the most of them with the right storage solutions. 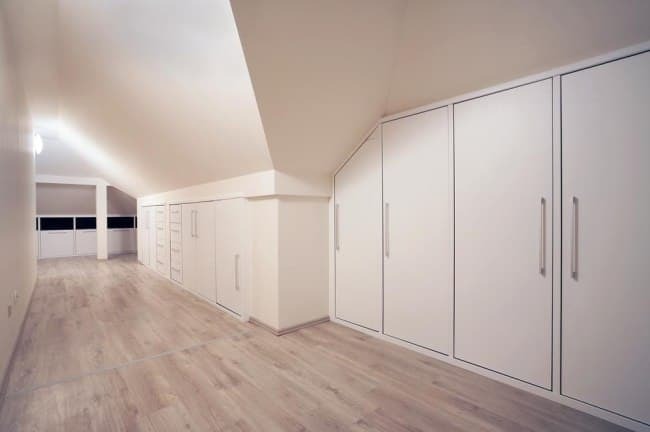 Use these small areas to create shorter closets that line your bedroom. It’s space that was previously unused and helps you gain valuable square footage. If you have taller walls that meet your ceiling and match the angle, it can be difficult to find furniture that will fit. Consider built in storage that’s custom made to fit the unconventional space. By installing these shelving units into the walls, you’re not taking up any floor space with bulky pieces that don’t really fit the space. Keeping this clutter off of the floor and neatly fit into your room helps keep the space open and feeling larger. 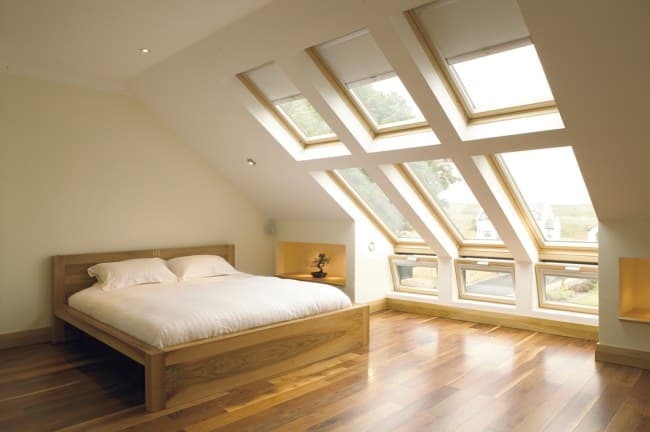 One of the best things you can do for an attic bedroom conversion is make sure that you install the right window designs in your space. Having the standard small window at the top of your roofline isn’t enough to make the space livable and reach its fullest potential. From a technical stand point, you’ll need at least one larger window that is easily accessible. In order to meet building code, your attic needs to have at least one window that can provide an emergency exit in the event of a fire. Windows can also add a lot to your new bedroom’s design. Natural light, rather than artificial light, helps make a room feel larger and brighter. Skylights are a popular addition to attic conversions because of their natural fit into a roof line and the benefit of added headroom. Another window design for attic conversions is the Dormer window. These windows extend out from a sloped roofline to create small nooks in your floor plan and add a dynamic element to your home’s exterior. These small spaces are the perfect spot for benches or desks that double as storage units and would otherwise clutter your space. 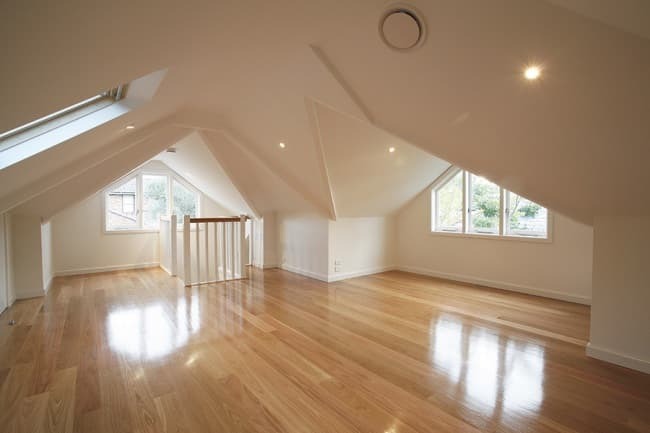 Before you install any kind of flooring for your attic bedroom conversion, you’ll want to ensure that your floor is a solid and structural sound surface. When converting a storage attic to a bedroom, you’re adding a lot more movement and constant weight on the floors. Reinforce the floor joists to create a safe environment for whoever may be using the bedroom. Your attic floors don’t have quite as much flexibility as the rest of your new bedroom. While hardwood floors are coveted in all other parts of the house, carpet may be the better option. One of the major reasons for carpeting over hardwood is the sound proofing benefits of a softer floor. Assuming your attic is above other living spaces, you will want to cut down on the amount of noise from both sides. Carpeting absorbs sound and requires an extra layer or two of subflooring eliminating a lot of noise from below. If you choose to have hardwood floors in your converted attic, be sure to include sub-flooring to keep extra noise out. 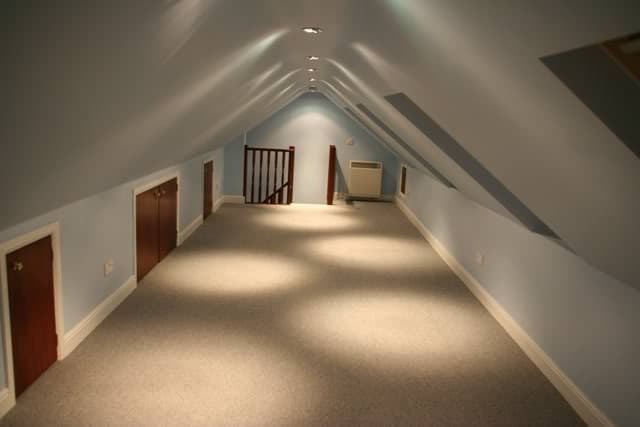 By converting your attic into a new living space, you will need a reliable means of access. Attics that aren’t frequently used commonly have ladders installed to reach their storage areas. The small footprint means your entire floorplan doesn’t have to revolve around your staircase. However, these ladders can quickly become unsafe and are not meant for regular everyday use. They lack the stability that you find with an actual staircase. The most common attic conversion stair design is a traditional stair. This is what you would typically find a home with a straight staircase that extends out from your attic entrance in a large rectangle. While this definitely more stable than a ladder and has full steps, it takes up a large portion of the floor below. A spiral stair can bridge the gap between these two designs and fill in where each of them falls short. A spiral stair has full steps, making it much easier to use than the thin rungs of a ladder. The spiral design means these full steps build on top of one another, keeping the footprint to a small circle in your floorplan. With highly customizable designs, you can easily find the spiral stair that will fit your space in both square footage and style. Because most attics are used for strictly storage, they don’t have the typically don’t have the utilities that you need for a livable bedroom. The two biggest categories are electric and temperature control. There’s probably already some electrical wiring in your attic, but will most likely need more light fixtures and outlets once you’ve converted the space into a bedroom. In this way, an attic conversion is much easier than a garage conversion, because it’s already on the same grid and you won’t have to run wires underground, but rather through the walls of your home. When it comes to your light fixture choices, try and choose designs that won’t give off too much excess heat. Recessed lights are a great way to fill your space with light without heating the space as well. They fixtures are tucked into the ceiling instead of having a bulb out in the open. This is going to be one of the most important parts of your attic bedroom conversion. Because hot air rises, your attic will be hotter than the rest of your home in both winter and summer. You will need to implement some temperature control measures to make sure the room stays at a comfortable temperature. One of the easiest ways is to install a ceiling fan. This may seem simple and like it won’t make a difference, but it’ll help cut down on the excess heating and cooling bills. It won’t solve all of the temperature control problems, but it will certainly help. During the conversion process, you will want to make sure to invest in a good spray foam insulation for your attic. It fills any crevice that could cost you money in your HVAC bills later and also helps to soundproof the space a little more. Insulation can be installed in your floor, walls, or ceiling beneath the roof. Any of these areas can help to control the temperature in your attic bedroom. Your attic may already be included on your home’s HVAC system. While this was fine for basic storage, you will need to have a lot more temperature control when someone is living in the room full time. To accommodate the higher use, you may want to put your newly renovated attic on its own zone. Converting your attic into a bedroom is a great way to add value to your home without having to build an addition to your home. 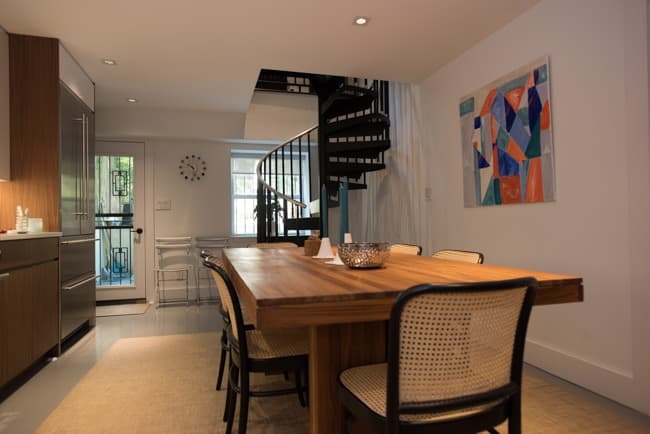 If a new means of access is included in your plan, call one of our consultative designers today for pricing on a custom spiral staircase in five minutes or less.